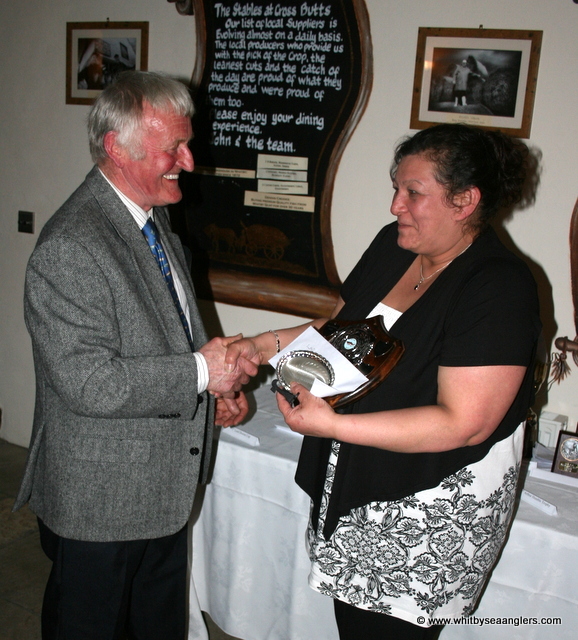 Secretary's wife, Chris Horbury, had organised a fun quiz for members and their partners. 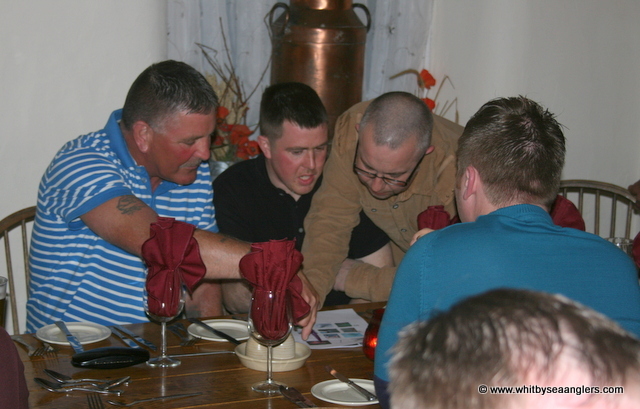 After the meal, Chairman William Atkinson started proceedings with his customary summary of the season. 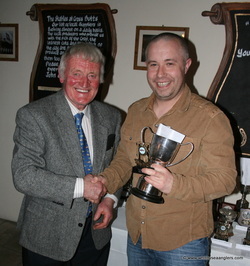 William commended Scott Moore on a remarkable first season with WSAA, coming 8th, landing the Heaviest Fish of the season, 11 lb 09 oz on 28th Nov. 2012, and for being runner up in the singles knock-out competition. William spoke of another remarkable season for WSAA Champion Matthew Garbutt, for the second year running, not only catching twice the number of fish of 2nd place Neil Inglis, but weighing in just over double his weight. 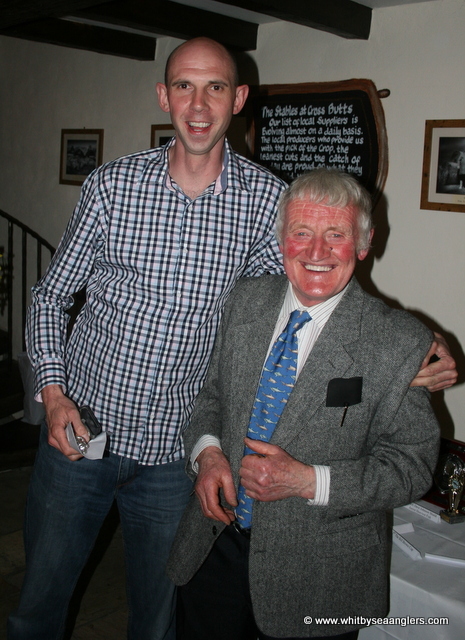 Unfortunately Matthew did not beat the long standing records set by Denis Thompson in the 1986/87 Season, 229 fish for 344 lb 03 oz over 53 matches (as opposed to 52 matches for the 2012/13 Season). 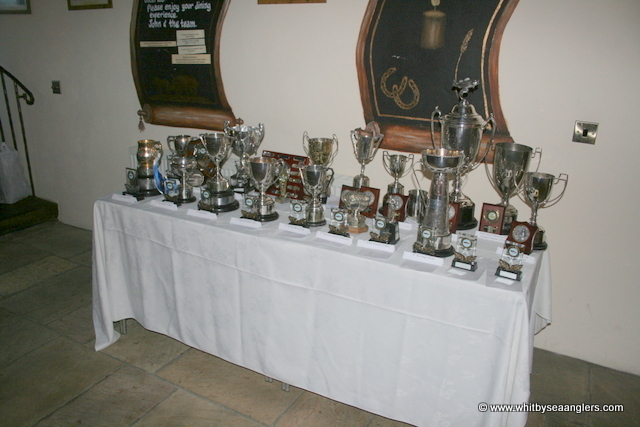 Matthew did set a new record for the Heaviest Bag of fish for a Sunday 4 hr match on 25th Nov. 2012, 7 fish for 31 lb 06 oz. William spoke highly of Junior member Jay Allison who has a knack of out fishing his father Rob. Secretary Peter Horbury and William then presented the worthy winners with their trophies (photographs by Peter Horbury). 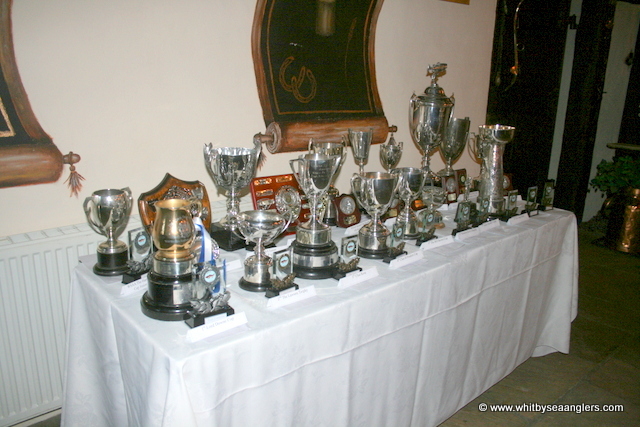 After which William gifted the Weigh Master James Gilpin, Treasurer Dave Perrett and Secretary Peter Horbury, with assorted bottles of wine and spirit for their work in maintaining the smooth running of the club for the members. The Fun Quiz organised by the secretary's wife, Chris Horbury, was won by Neil and Allison Inglis. 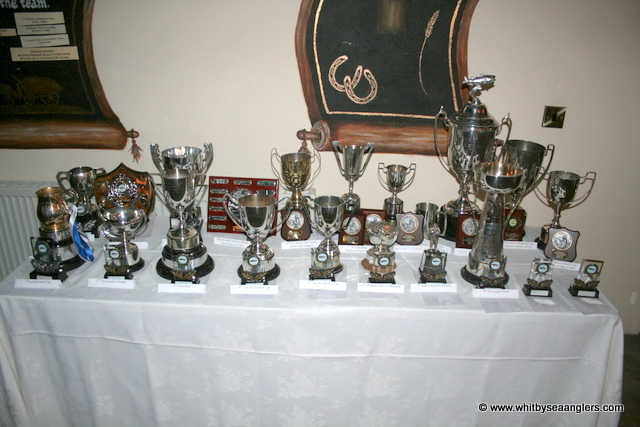 On behalf of WSAA the secretary, Peter Horbury, would like to thank the staff at The Stables and thank you to all members for attending, see you all next year. 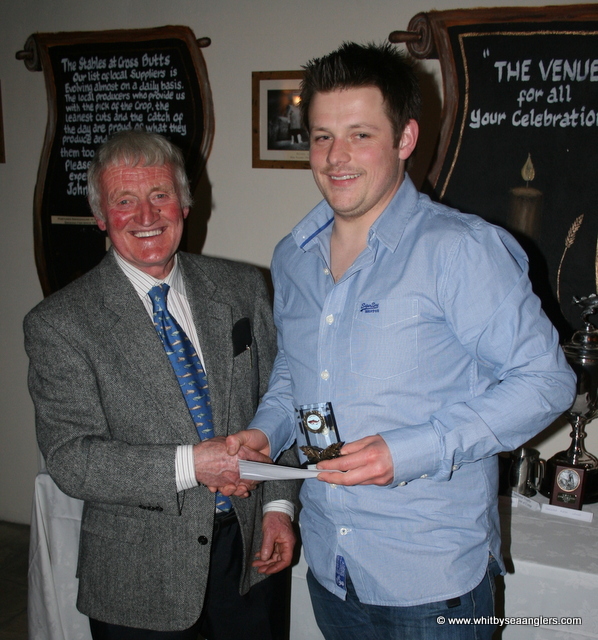 Matthew Garbutt for the second year in a row. Matthew Garbutt receives the Lord Downe Cup from chairman William Atkinson for the second year in a row. Matthew caught 220 fish for 342 lb 04 oz, giving an average of 1 lb 09 oz. Matthew won no less than 5 of the 6 Heaviest Bags of Fish of the Month sweeps and 2 of the 6 Heaviest Fish of the Month sweeps. 10th Feb. 22 lb 11 oz, 3rd Mar. 27 lb 14 oz. HF - 20th Jan 7 lb 13 1/2 oz, 10th Feb. 8 lb 05 1/2 oz. Neil Inglis receives the The Lawson Trophy*, from chairman William Atkinson. Neil caught 106 fish for 170 lb 14 oz, giving an average of 1 lb 10 oz. 9 lb 11 1/2 oz on the 25th. 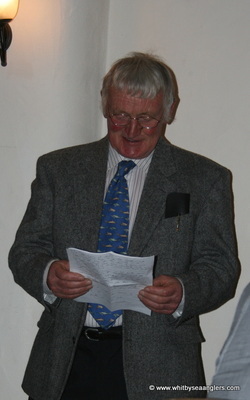 Rob Allison receives the Chas. Rose* from chairman William Atkinson. 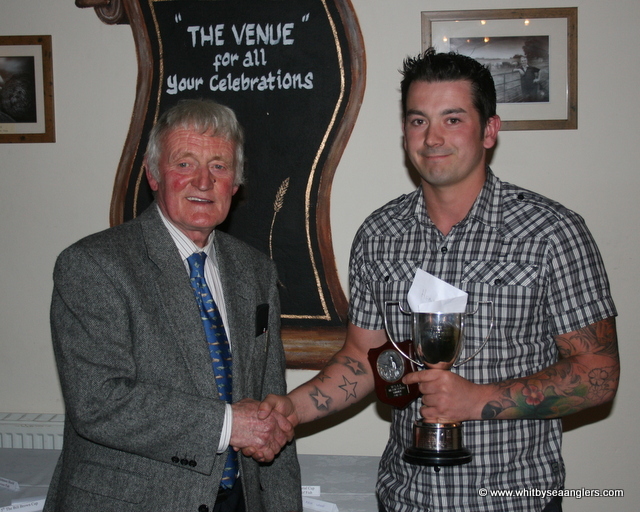 Rob caught 65 fish for 161 lb 14 oz, giving an average of 2 lb 08 oz. 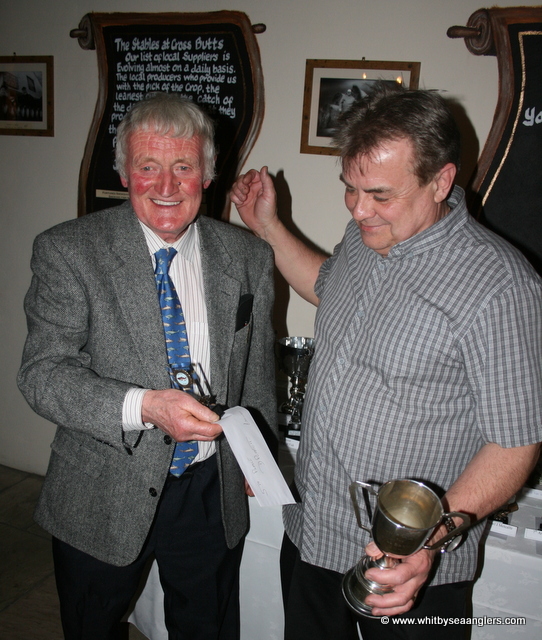 Dave Hambley receives the Chas B Prudom Cup from chairman William Atkinson. 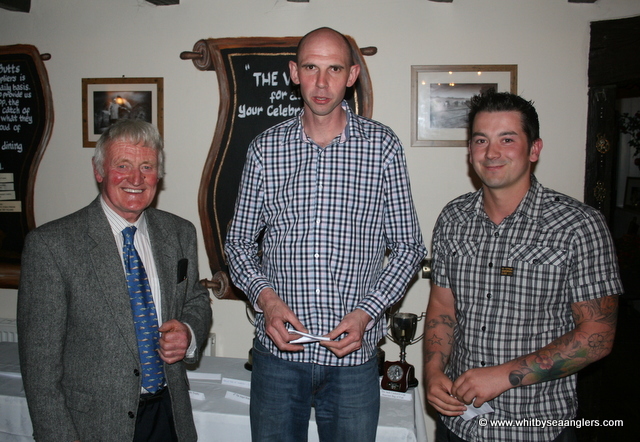 Dave caught 92 fish for 154 lb 13 oz, giving an average of 1 lb 11 oz. Dave also won the Heaviest Bag of Fish sweep for December, 21 lb 06 oz on the 23rd, which won him the Christmas match. 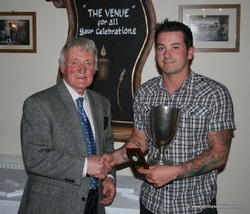 Dave N Perrett receives The Bill Brown Cup from chairman William Atkinson. Dave caught 95 fish for 143 lb 15 oz, giving an average of 1 lb 08 oz. 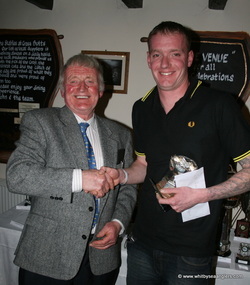 Dave also won the Heaviest Fish of the Month sweep for March, 7 lb 02 oz, on the 6th. Andrew Cass receives the Members Bowl, I Metcalfe from chairman William Atkinson. Andrew caught 80 fish for 105 lb 04 oz, giving an average of 1 lb 02 oz. 8 lb 09 oz, on the 10th. And the Heaviest Fish caught out of Competition (below). 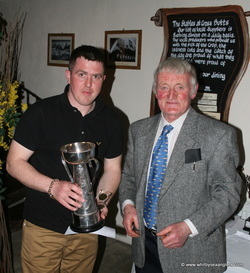 James Gilpin receives the Arthur Humble trophy from chairman William Atkinson. 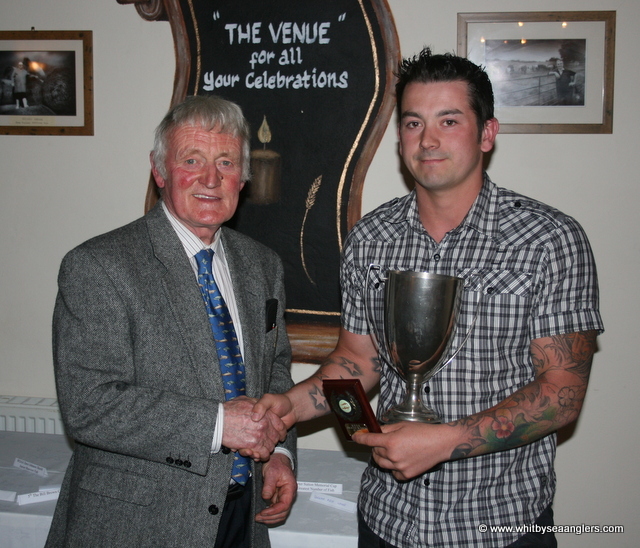 James caught 80 fish for 95 lb 12 oz, giving an average of 1 lb 03 oz. 11 lb 08 oz on 19th December 2012, which won him the Heaviest Fish of the Month sweep. 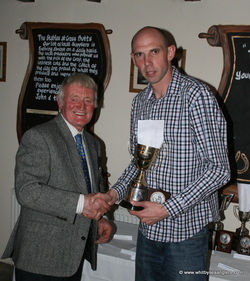 Only 1 ounce short of equaling a fish of 11 lb 09 oz caught by Scott "Pippen" Moore on 28th November 2012. 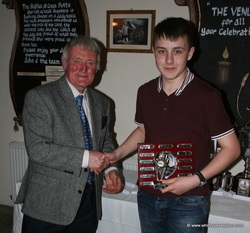 Scott receives the Angel Hotel trophy from chairman William Atkinson. Scott caught 57 fish for 95 lb 07 oz, giving an average of 1 lb 11 oz. Scott was only 5 ounces short of equaling James Gilpin's weight for 7th place. William praised Scott, in his speech, for a remarkable first season with Whitby Sea Anglers Association. 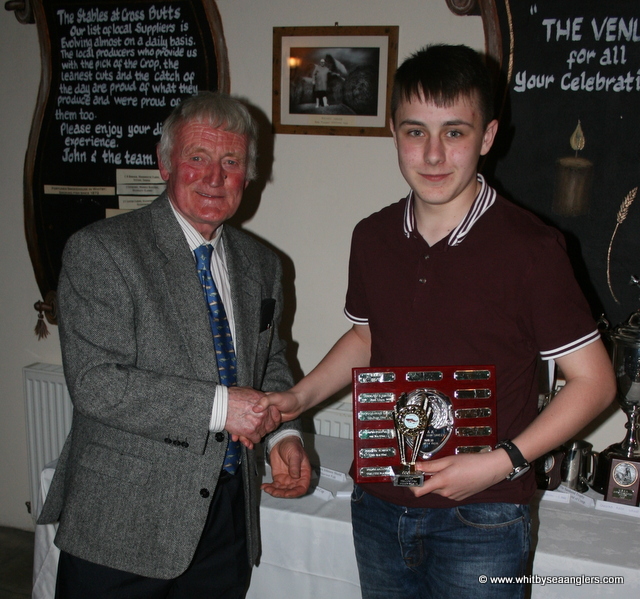 Ben receives a plaque from chairman William Atkinson. 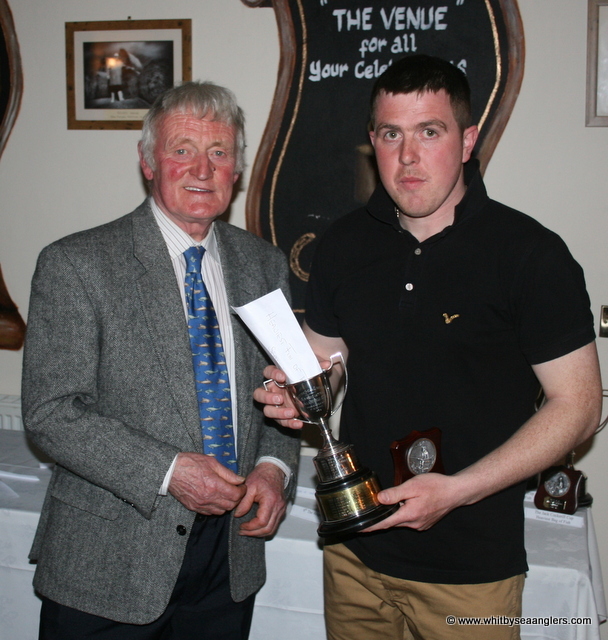 Ben caught 65 fish for 86 lb 13 oz, giving an average of 1 lb 05 oz. 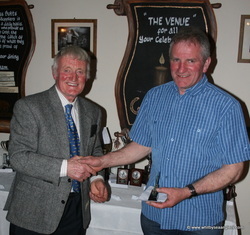 Colin receives a plaque from chairman William Atkinson. Colin caught 45 fish for 72 lb 00 oz, giving an average of 1 lb 10 oz. 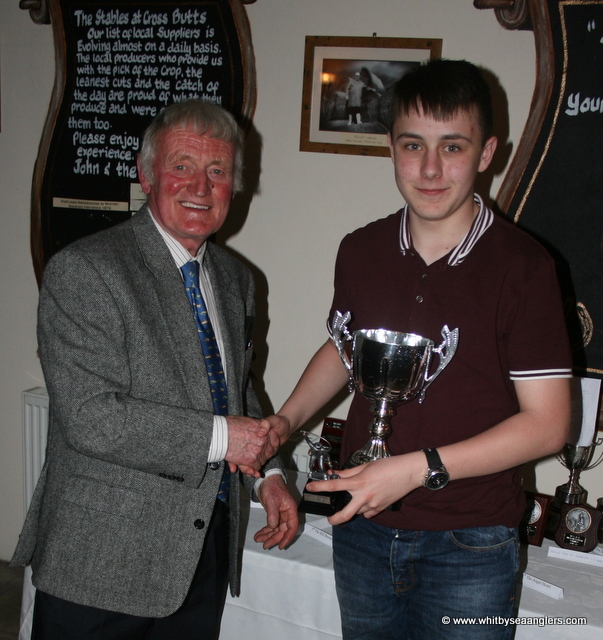 Jay receives the Harry Whorlton Cup from chairman William Atkinson. Jay only fished the Christmas match and caught 2 fish for 8 lb 02 oz, giving an average of 4 lb 01 oz. Jay (HF 6 lb 06 oz), as William reminded everyone, had again, out fished his father Rob. Paula receives the new ladies shield and decorative plate from chairman William Atkinson. The 1st lady angler member was Ingrid Wren who in the 1965 - 1966 season was 5th and caught 4 st 07 lb 02 1/2 oz of fish. Ingrid later married and set up Ingrid Flute Holiday Homes in Scarborough. 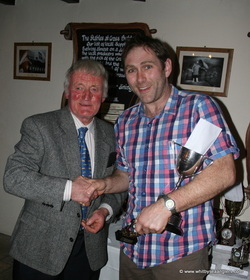 Jay receives the Junior Heaviest Bag of Fish trophy from chairman William Atkinson. Jay caught 2 fish in the Christmas match for 8 lb 02 oz. Jay receives the Dave Johnson Heaviest Fish Shield from chairman William Atkinson. His heaviest fish 6 lb 06 oz was caught in the Christmas match. 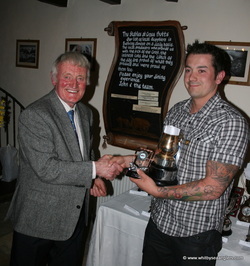 James receives the GR Russell trophy from chairman William Atkinson. James' match by match journey. 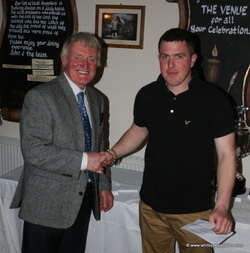 Scott receives his runners up sweep prize from chairman William Atkinson. Scott's match by match journey. 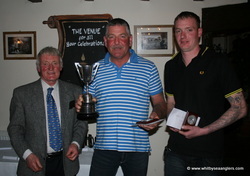 James and Andrew receive the AA Spedding Memorial Pairs Trophy 1984 and sweep prizes from chairman William Atkinson. James and Andrews match by match journey. James and Matthew receive their runners up sweep prize from chairman William Atkinson. James and Matthews match by match journey. 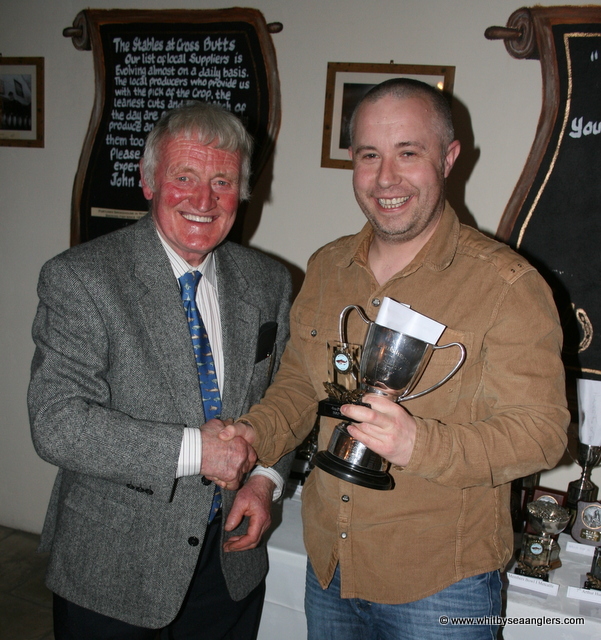 Scott receives the F Kirk trophy for the Heaviest Fish caught in competition from chairman William Atkinson. 28th November 2012 Scott caught a cod of 11 lb 09 oz. 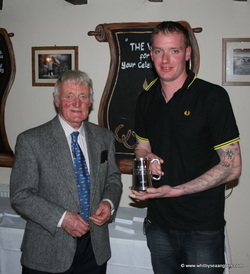 Andrew receives the Sandsend trophy / tankard from chairman William Atkinson. 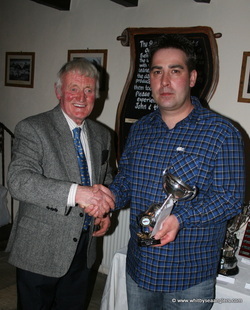 Andrew, during the Cloughton Open on Sunday 2nd December 2012, came second with a fish of 12 lb 04 oz. *out of any WSAA competition. 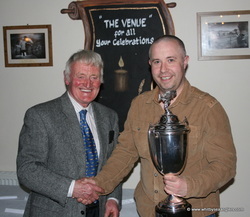 Dave receives the Christmas Match trophy from chairman William Atkinson. Dave caught 5 fish for 21 lb 06 oz during the 5 hr match. 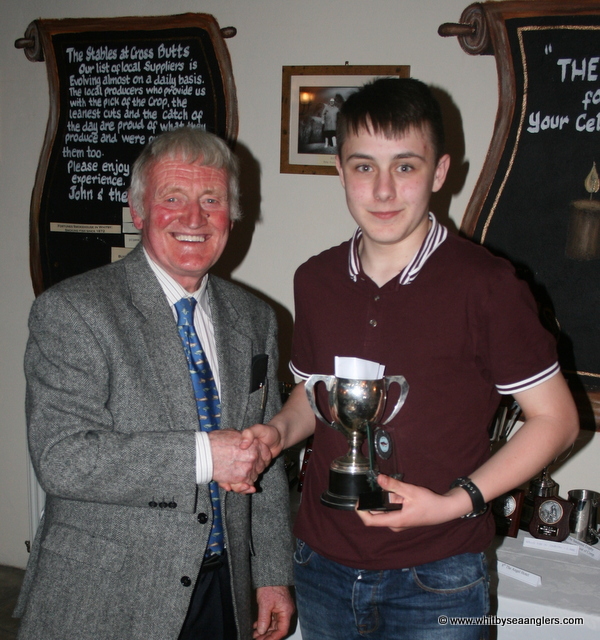 Matthew receives the the Peter Sutton Memorial Cup for the Greatest Number of Fish (Presented by Mr Alec Bain) from chairman William Atkinson. Matthew caught 220 fish for 342 lb 04 oz. 9 fish short of equaling the 1986 - 1987 season record set by Denis Thompson. Matthew receives the Jack Cockerill trophy for the heaviest bag of fish from chairman William Atkinson. On the 25th November 2012, Matthew caught 7 fish for 31 lb 06 oz, which is new WSAA Record for a sunday 4hr match.